Hanif Harji, a young Muslim restaurateur, is overseeing the preparations for the evening at Blowfish, a trendy restaurant-bar in the Canadian city of Toronto. With his palm planner in hand, he walks along the stylish bar in this former bank building on the way to the kitchen, for a word with G.Q. Pan, the chef of Chinese background. He will prepare Japanese dishes tonight, fused with Vietnamese, French, Caribbean and Indian influences. Harji, who grew up in the suburbs of Toronto after immigrating to Canada from Tanzania with his parents, is proud of his establishment, a hit with a mixed clientele of young professionals in the city. He founded Blowfish with Zark Fatah, a fellow Torontonian of Indian-Pakistani origin. Along with their Jewish partner Jo Siahou, they are meeting a demand for a stylish sushi restaurant – thanks to the fact that the population of Toronto has “embraced cultural differences,” he says. The cultural smorgasbord at Blowfish is typical of the new Toronto, a large city where diversity is not just tolerated, but celebrated. The Canadian metropolis is one of the most multicultural cities in the world: nearly half the population of 2.5 million is foreign-born; more than 40 per cent are visible minorities. Since 1996, Toronto and its sprawling suburbs, an urban area of 4.5 million people, attract 90,000 to 100,000 new immigrants per year, more than any other city in North America. In other big Canadian cities, such as Vancouver and Montreal, the number of visible minorities is also high, but Toronto is the undisputed flagship for diversity in Canada, the most developed laboratory of the country’s multiculturalism policy. The seed for the Canadian model of multiculturalism was laid in the 1970s. According to the official policy of multiculturalism, implemented by then-Prime Minister Pierre Elliott Trudeau, immigrants in Canada are not expected to reject their cultural background upon arrival. Based on the historical fact that no single ethnic group could ever lay exclusive claim to the Canadian identity – there were compromises between Protestant British and Catholic French settlers – acceptance of cultural differences was declared a basic Canadian value. Unlike the American ‘melting pot’, Canada declared itself a ‘mosaic’. It has taken a few decades, but that mentality has become increasingly entrenched in the Canadian psyche, says Andrew Parkin, Co-Director of the Centre for Research and Information on Canada. He points to the emergence of a “tolerance culture” in the country. This apparent paradox is a crucial element of the new Canadian self-awareness. Canadian identity, which for decades was considered hard to put a finger on, has been redefined in recent years – not in spite of the many different ethnic origins of the population, but precisely because of that diversity. Whereas previous generations of Canadians took particular pride in the country’s natural beauty or in Canadian contributions to international peacekeeping missions, now the diversity of the population, the ability of people from different backgrounds to live together in peace, is usually identified as the most Canadian trait of all. Many in Canada have come to the realization that the lack of a singular cultural origin is not a national weakness, but a strength. 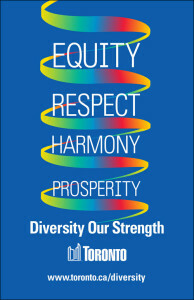 Toronto’s motto: ‘Diversity Our Strength’. The same inconspicuous diversity can be seen in Toronto’s streets. A walk along one of the city’s main arteries, such as Yonge or Bloor, feels like an endless ‘United Colors of Benetton’ ad. Not only do you see Asian, Caucasian, Arabic, Hispanic and black Canadians, you also see them in mixed groups, at tables in the food courts at shopping malls. The city has a proactive integration policy to nurture that diversity. Its first priority is to make sure that newcomers feel at home, says Rose Lee, Coordinator of Diversity Management at City Hall. Information about municipal services is distributed in different languages, festivals are sponsored to celebrate all different cultures, and special arrangements are made for minority groups with “special needs”, she says. For instance, in neighbourhoods with a large number of Muslims – the city has a Muslim population of over 200,000 – swimming pools are opened exclusively to Muslim women during certain hours, because otherwise they could not come. “It’s important that the city helps immigrants to settle and makes them call the city home,” says Lee, whose office is in constant touch with various ethnic organizations and forwards requests and recommendations to City Council. “The city consults the communities,” she says. “Part of the reason why Toronto doesn’t have the kind of conflicts or race riots like the United States has to do with the fact that we provide channels to communities to express concerns.” In terms of peaceful coexistence of various ethnic groups, Toronto is a “success story”, she argues. Even so, she acknowledges that there are problems. The fact that recent immigrants and visible minorities are, on average, poorer than the general population, is a concern. There has been racism and discrimination against Muslims in Toronto, especially since September 11, 2001. Others are more critical of the image of Toronto as a multicultural paradise. Amy Casipullai of the Ontario Council of Agencies Serving Immigrants (OCASI), an umbrella organization for immigrant groups, believes a person’s perception of Toronto depends in large part on their immigration status and skin colour. In Parkin’s view, it is a matter of time before Canadian diversity will fully filter through to all layers of society. The younger generation of Canadians, who attended mixed schools and to whom mixed relationships and friendships are common, will ensure that a “quiet acceptance” of diversity will penetrate into positions of leadership, he predicts.